1. HOW DID YOU DECIDE ON THE NAME OF YOUR BLOG? 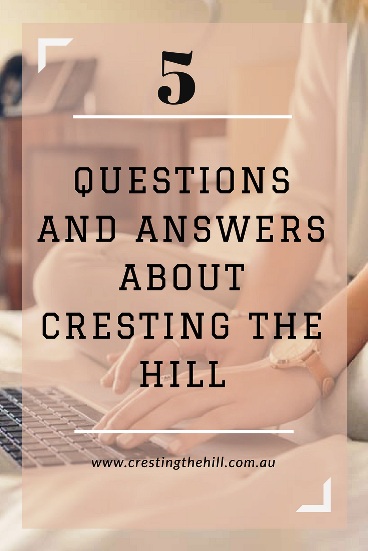 I chose Cresting the Hill because I see Midlife as reaching the top of the hill after a long and sometimes arduous climb. It feels like a breathing space where I've earned a rest and can sit back in the sunshine and a little breeze and enjoy the view. 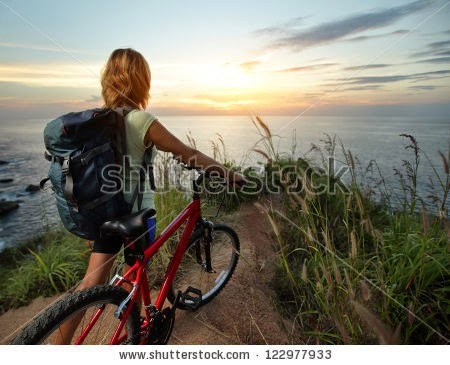 A couple of years ago I bought a bicycle and when you start pushing uphill it seems endless, but it feels amazing when you reach the crest because it means getting ready to take your feet off the pedals and cruise on down the slope. I'm looking forward to cruising down the other side of the hill in the years to come. It comes from my life - reaching a point where the kids had moved out and my husband and I had gone through all the upheavals of finding our connection again. I really enjoy the process of finding something that makes me think and then putting it into words that hopefully others can relate to. What I realized recently is that my blog has become my voice - it gives me the ability to articulate all the thoughts and feelings that have been stuck inside for a very long time. To open up and share and have others respond with similar experiences is an absolute joy for me. I thought it would be an isolated pastime but instead I have "met" and LOVE all the other bloggers I'm connecting with - there are some really lovely women out there (yes that is you if you are reading this) who share their lives and their encouragement and I am really loving that. I feel like I have friends all over the world and that we have so many similarities, despite living thousands of miles apart. Tackling Midlife with an open mind and a positive spirit has been the biggest outcome for me - there is no way I'm fading into the background! 4. WOULD YOU RECOMMEND BLOGGING TO OTHERS? 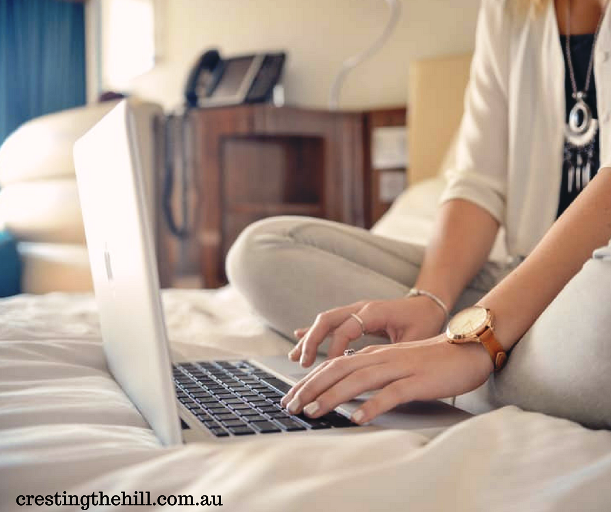 Blogging isn't for everyone, you have to love writing and putting your thoughts together in some sort of coherent fashion. You need to have a reasonable amount of discipline to put up posts regularly and to make them look readable and interesting. You also need to not mind sharing your life with the world - not everyone feels comfortable doing that (and it has hidden pitfalls at times). That being said, I would put blogging very close to the top of my list of "best Midlife discoveries" - it would have to come after grandbabies because NOTHING beats a grandbaby - but other than that, it's pretty darn fabulous and worth having a go at. It costs nothing and gives me so much pleasure. 5. WHERE DO YOU SEE YOUR BLOG IN 5 YEARS? I really hope I'm still banging away on my laptop in five years time. I hope I still have interesting thoughts and discoveries to share. I would love to think that my writing keeps improving and I keep connecting with more and more Midlife women who are seeking to be their very best as they launch into the second half of life. I've changed so much since I turned fifty - that was five years ago and in another five I'll be sixty and there will be so many more stories under my belt. I'm really looking forward to sharing them and to engaging with all the interaction that comes from the comments that other lovely people leave me each week. Thanks so much for being part of this - I hope we're all still sharing in five years - when my Celebration of Sixty kicks in! Thank you for sharing. I agree with the you have to be dedicated to have a blog. It takes a fair amount of time and motivation to keep pounding away at it month after month doesn't it Lee? I am always so impressed with people who have been blogging for 10+ years and still going strong. I think you have to love writing to be a blogger, otherwise you will soon walk away from it. I may use your 5 questions for my upcoming 5 years' blogversary later this month. I'd love you to use my five questions as part of your blogversary Tamara - five years is definitely a milestone - good on you for keep it up while you're running around doing all the mum stuff too! I LOVE the origin of your blog title and YES YES YES to #3!! Those connections are what keep us all going aren't they Marcia? They were the unexpected pot of gold at the end of my blogging rainbow! I blog for very similar reasons; I love having a place to share my experiences, hoping others will gain inspiration through their own changes. Thanks for sharing your voice. Your voice is one that touches us as women and empty-nesters. I love reading your blog Melody - I think we both approach our empty nests from similar perspectives and I find that so encouraging. I love that the crest seems to be a long one Kathy - it'd be nice to think of us all up there still enjoying the view into our 70s! Your blog has always been an inspiration to me for it's commonsense and helpful advice. So much fun to read. I totally agree with all of the above, but especially #3! Yep that number #3 is what keeps us all coming back isn't it Diane? It's been so lovely meeting other women enjoying this stage of midlife - such an encouragement. This was great, Leanne. 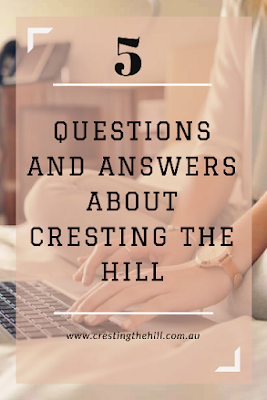 You hit on all the reasons I love blogging and finally answered how you got that lovely, apt name, "Cresting the Hill." Glad we're fellow bloggers! 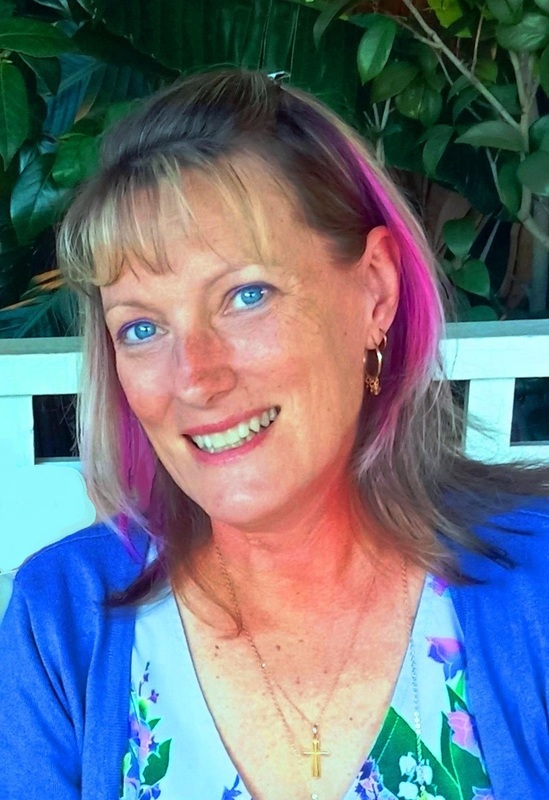 Me too Laurie - isn't it lovely to meet other women who are writing about their lives and connecting on so many levels? Who'd have thought there were so many of out there having such a good time? I loved reading your answers Leanne and I believe mine would be similar. Because we have been blogging almost the same time we have been fortunate to meet and share the blogging journey - the good and the bad. Some days I think I'll be blogging forever and other days I wonder why I do it. Then I chat with other bloggers, like you or readers of my blog and that encourages me to keep going. You will certainly be Sizzling Towards 60 & Beyond and I'm sure you have many more life stories to tell. I'm about to move into a new decade - I wonder what my story will be? I wonder the same thing Sue - from our 50s and then to suddenly be in our 60's. One thing I've discovered as I look back is that each decade has built on the one before and actually gotten better - the 60s might very well be spectacular! I think the view from the top is amazing Alana - and from what the other commenters are saying, there will be a lot of us up there for quite a while to come while we feel the breeze in our hair and enjoy that view for years to come. Hi Leanne, a great way for readers to get to know your blog. Thanks for linking up and sharing with us at #overthemoon. I've pinned and shared on social media. Have a great day and see you next week!